EA CEO John Riccitiello dreams of a "clash of the titans" between Call of Duty and Battlefield 3, a game that is designed to take the shooter crown from Activision. When it comes to cash cows, Activision's Call of Duty franchise is like Babe the Blue Ox: It's huge, it's dominant, and it makes all the other not-huge-not-blue oxen rather jealous. EA has set its sights straight on its biggest rival's biggest moneymaker, and big boss John Riccitiello thinks that this holiday season will be the biggest showdown yet. 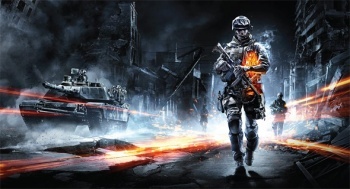 "This November we're launching Battlefield 3," Riccitiello said at the Ad Age Digital Conference in New York City. "It's going up against the next Call of Duty, which is presently the number one game in the game industry. It's a game that did $400 million in revenue on day one." "[Battlefield 3] is designed to take that game down. If you're looking for a battle of the titans, a Red Sox versus Yankees, if you're trying to understand if it's Microsoft versus Google and what the tip-off point is for this holiday season - this is it." EA is prepared to put its money where its mouth is, too, said Riccitiello, claiming that there will be a "couple of hundred million dollars of marketing" between the two games" going head-to-head. "[We] think we've got the better product. It's going to be a blast." To speak frankly for a moment, this really doesn't fill me with hope. DICE is a great studio that has turned out some of the best shooters ever made - there's no denying that Battlefield definitely has the chops to go head-to-head with Call of Duty: The Next One. But making a product specifically tailored to beat a competitor just seems like a poor decision to me, and we all saw how well it worked for Medal of Honor. Shouldn't you try to make a game that you think is good, with design that you can believe in on its own, rather than trying to ape and surpass your competitor? If gamers want a game like Call of Duty, they'll play Call of Duty, not an imitator. DICE (and EA's money) would be much better served making a game that's wholly Battlefield, not Battlefield 3: Call of Duty Edition. But maybe that's just me.